It was photoshoot time. I have all the backdrop and camera with tripod setup in my sewing room so I don't need to run out chasing the sun. I like to sew more than I like to take pictures, but you cannot tell by these shots. I was having so much fun with my photographer and assistant- the remote control, and my granddaughter. BTW....she told me to pose with the jeanie prayer hands. 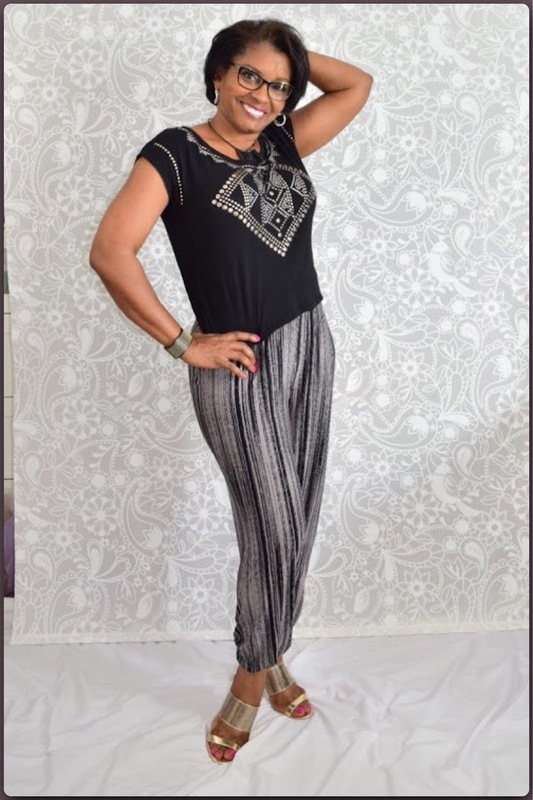 ALTERATIONS: I just the size D for length and didn't pay attention to the hip or waist because I used my base pant sloper/block or TNT to check the fit before I cut the pattern. I over-layed my pattern block on top of this pattern and lined up the grain-lines to make sure the crotch and the waist seams were what I needed. 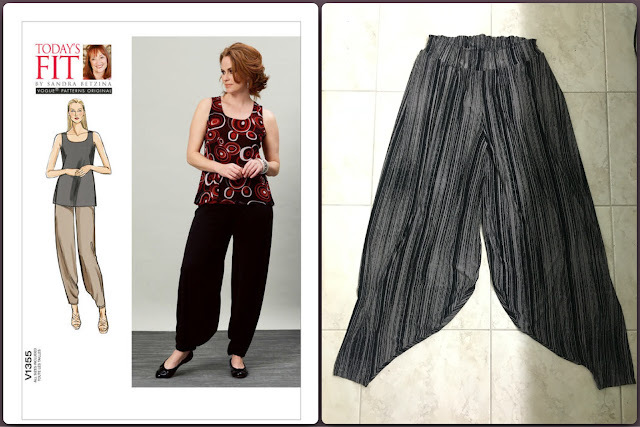 As it turns out, as with every other pant pattern, I lowered the front waist by 1.5" and extended the back crotch extension by at least an inch and shortened the front crotch extension by the same amount. 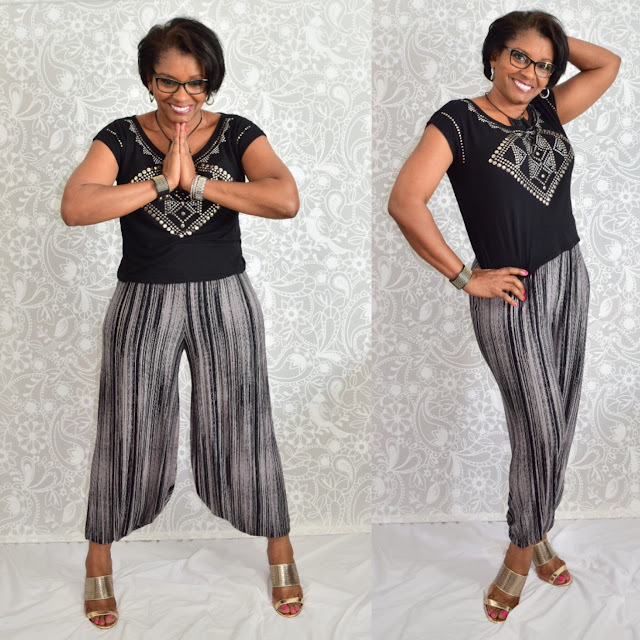 If you need a pair of absolutely quick and fun pair of pants to wear, this is the one. Listen to a friend, in my case, Cennetta of The Mahogany Stylist, they won't lead you astray. At first I thought that extra fabric hanging between my legs would drive me crazy, but I haven't really felt it. Ohhh!!! I have worn then these pants way too much. So, I guess that means I need to hurry and make another pair really soon. Great looking fancy pants if I must say so myself. Lol. Love your fabric choice. Thanks Cennetta. Now I want another pair, and can't decide on the fabric. AAGGh...the dilemmas of a fabricholic. You are so right about "see and sew". In my case see and plan to sew if I can get around to it. Love those pants on you. Would love to have a pair for myself! These pants will go on my list too as they really do look great on you Andrea. Right Ann. All these ideas and "to-sews" are growing. Thanks. Those fabulous. I had the same thoughts as you about that pant pattern. May have to give it a try. Would love to see a video tutorial on how you use your TNT pant to check the fit. Thank you Andsewforth. I did a periscope on how I did the fit test. It's going to be on my list to add to youtube. Thanks for following. These look great on you! I have had this pattern sitting in my stash since they came out and maybe I should pull them out and make them up. More power to you for pushing your comfort zone. Thank you Nancy. I do have to say...I need to try new things more often. This was quite a surprise. Even though I don't like shopping, it might be time for me to go try new silhouettes. Love them! I thought these were odd when the pattern came out and have never been tempted to sew them. You just changed my mind! I hope I look as good in mine as you do in yours! Awe Sharon. You really should give it a go. I think you look just as spunky. I didn't like the look of this pattern. Now that I see the pants sewn and worn, they look great. 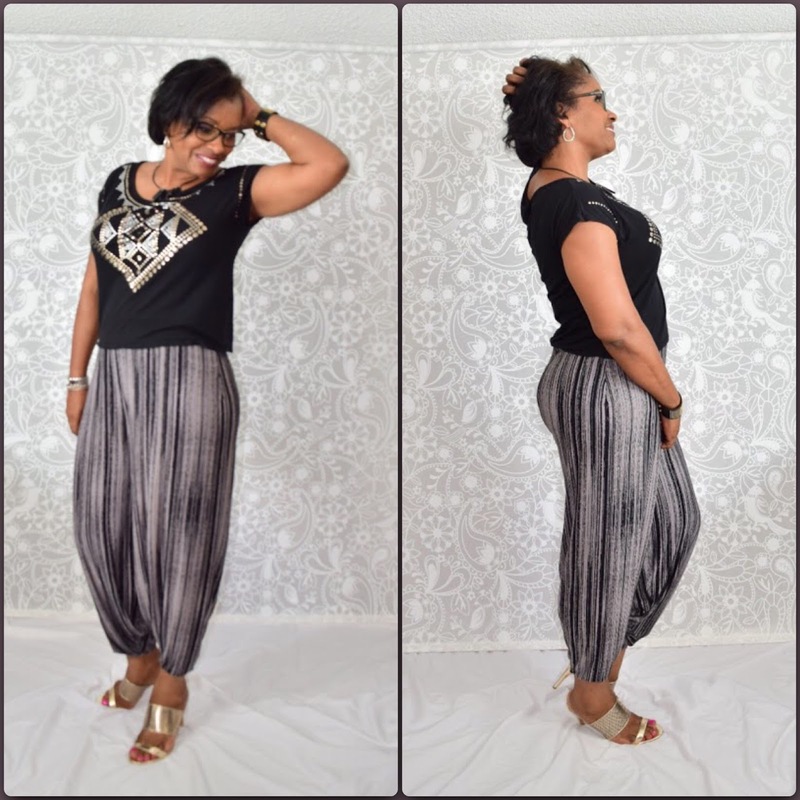 Love the top and pants you are wearing, the fit and style looks great on you! Thank you Linda. You will be so happy with them! They are fun to wear. You look fabulous in these pants! I made these pants too and I absolutely love them. I am only 5'3" and I also worried that I was too short. I took 2" from the length and 1" from the crotch and they look great. The material I chose was a slate grey modal jersey which drapes beautifully. I cant wait to make another pair.